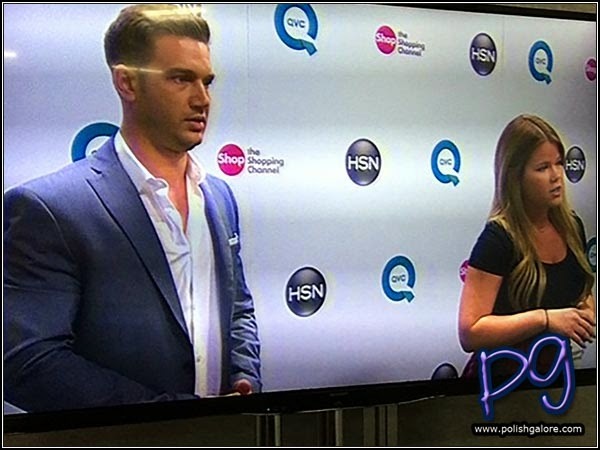 I randomly walked up right before the brother-sister team behind LVX had their audition for QVC/HSN/Shop - they made it in the final round of auditions and have a great shot at being on one of these three channels! I had no idea that LVX was going to be at Cosmoprof North America this year, but I was excited to see them in Discover Beauty again this year. Branka and Rade Tomic are a fantastic example of when family businesses work and work well. 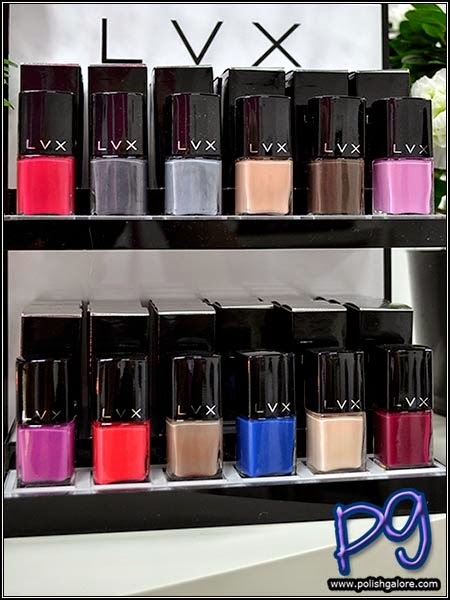 LVX has consistently been churning out on trend polishes each season and just recently came out with their own gel-like top coat. Nerd moment - they also came out with new boxes that have the cutout so you can see the polish you're purchasing before you buy it. I did get a sneak peek at the new fall collection (top row) which did not have names at press time. I asked Branka why she decided to go with two greys and she smiled and said "Because I can." 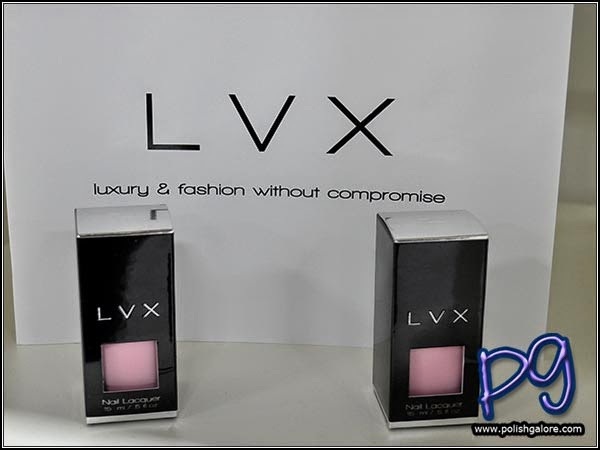 Keep watching for more amazing things coming from LVX here on PolishGalore! I think grey is going to be my color for fall. I just love a good grey! Boxes with a cut out are always so pretty, I love them :D. Can't throw away boxes but it's annoying if you can't see the content right away. I really do more. I keep secretly hoping for some glitters but since they are always fashion forward, it may be awhile. I agree! Especially for retail purposes. I'm still trying to find my perfect grey - wondering if this will be it! I've never tried anything from LVX! I love their bottle design, though. I have several of their polishes and love them! The pink on the bottom left looks nice! I've never tried any! But their fall collection looks great! Keep an eye on Gloss48 - they tend to have major specials on new LVX collections! Keep an eye on Gloss48 - they tend to have major specials on new LVX collections when they come out! Have you tried their new gel like top coat? I think it might have actually been a purple - I didn't do too well with color capturing haha! 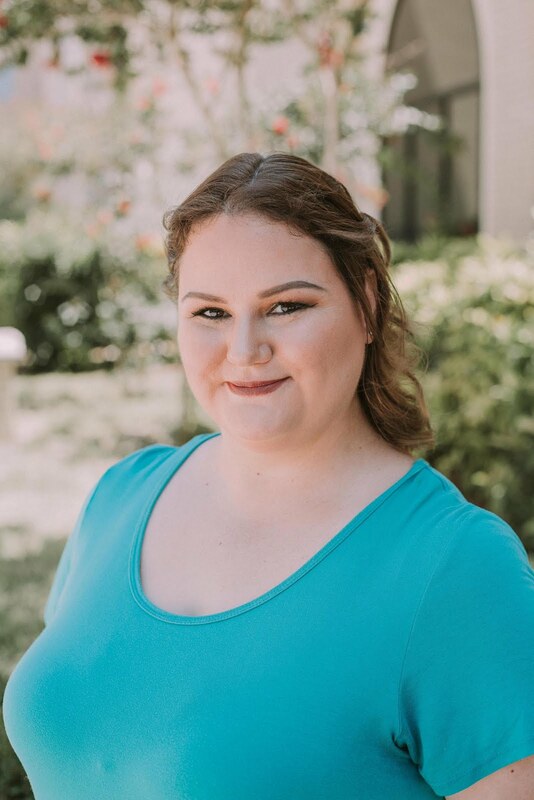 Gloss48 tends to have sales on new collections! This was actually something special held through Cosmoprof North America. Companies submitted a video ahead of time, then semi-finalists were called and they auditioned live for the channels. Only 20 companies got to audition but the channels could pick one, all, or none! Agreed! Even when I don't LOVE it on the first coat, the second coat has consistently been a winner for me. Watch Gloss48 - they have specials during new collection launches!